My most popular recipe is my Cauliflower Crust Pizza. But I was intrigued by all the zucchini crust pizza pins I'd been seeing lately. I had some extra zucchinis in my fridge and decided to give it a whirl. 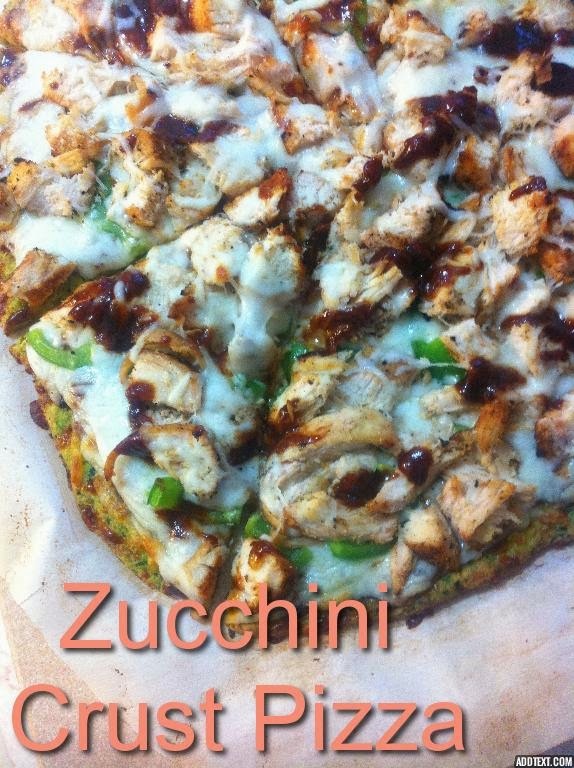 And you know, I may just like it even more than the cauliflower crust! It's also Gluten Free. Preheat the grill or oven to 450F/230C. Put pizza stone in oven to heat up. Grate zucchini, using a food processor or the large side of a cheese grater, then chop the grated zucchini with the regular chopping blades of the processor. Place the chopped zucchini in a microwave-safe bowl and microwave on high for about 4 minutes. Remove zucchini and dump into a cheese cloth. BE CAREFUL, it's really hot! Let zucchini drain until it's cool enough to handle. When zucchini is cool, wring out as much water as you can and place the zucchini in a bowl. Add the grated cheese, almond meal, dried thyme, garlic powder, salt, and beaten egg and stir until the ingredients are combined. Hands work well for this! Spray parchment paper with nonstick spray and divide the crust mixture into two balls or one large ball. Use your fingers to press out the crust mixture into two circles, being careful not to make the edges too thin (or they will burn). Keeping crust on the parchment, carefully place on hot stone in oven. Bake about 12-15 minutes until crust is firm and starting to brown. Remove from oven. Top with sauce, cheese, and toppings of choice... OR read on for my BBQ chicken pizza. To assemble the BBQ pizza, top each crust (or the large crust) with 1/2 cup BBQ sauce. Top with chicken, cheese, bell peppers, corn, and any other toppings you so desire. Garnish with cilantro. This pizza looks great. I'm going to give it a go tonight. Thanks. PB2 - Have your peanut butter and eat it too!